One of the biggest mistakes people can make when it comes to their investments is letting fear dictate decisions. When it comes to your investments, are you able to stay objective or do you allow fear to grip you when the markets get bumpy? There is a reason why Warren Buffett has the famed saying, “Be fearful when others are greedy and greedy when others are fearful.” It’s because when people make fear-based investment decisions, they are usually the wrong decisions because they are based on feelings rather than sound reason. A hallmark sign of smart investing is following a disciplined approach that doesn’t waver in the face of inevitable market volatility. It means that negative emotions (or positive) don’t cause you to make impulsive decisions about your investments. Here’s why you have to stay in the market to see gains in your portfolio. If you look at historical market performance, you will observe a couple of things. Yes, market corrections are a part of investing. If you zoom in on any given period in history, you will observe that the market rarely performs in a straight upward or downward trajectory for an extended period of time. Market swings can be big and small, but it’s usually swinging to some degree. But any challenging periods in the markets have proven temporary, and the power of the American economy has sustained the market’s move higher over time. This isn’t my feeling about the market. This is the fact about the market. Therefore, the first instinct of a nervous investor is to sell when the market sustains losses and buy back into the market when the market is moving to new heights. Both of these reactive tendencies can be hazardous to your portfolio over time. Human behavior also tells us that the most recent events often have an outsized impact on a person’s views and decision making. In fact, just looking at the market since 1940 tells us all we need to know. 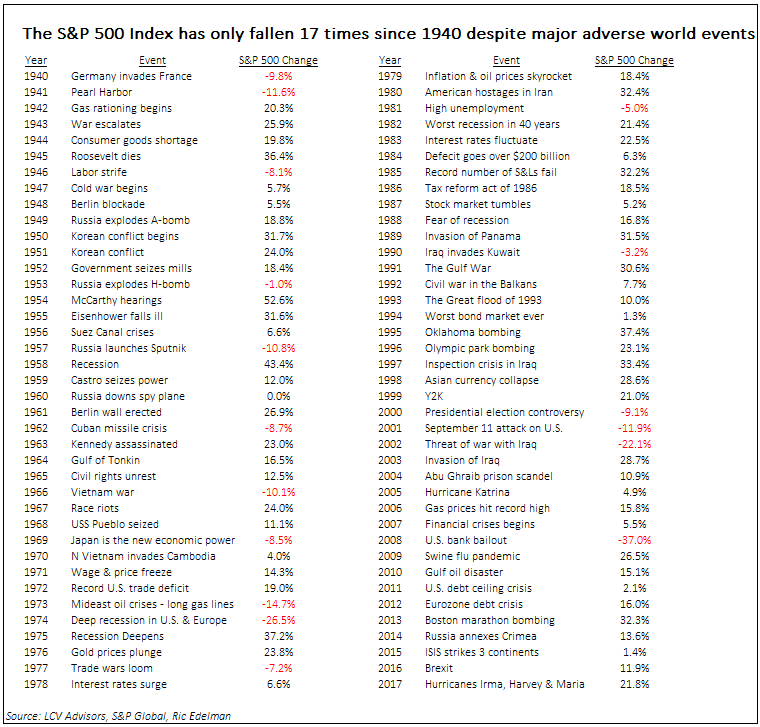 In the last seventy eight years, the S&P 500 has only fallen seventeen times, even with the most catastrophic of human events. You can’t control what the market does, but you can control what you do. It’s impossible to consistently predict when the next awful headline will cause a short-term market decline. While avoiding the market altogether can be the biggest hurdle to wealth creation for retirement, trying to time a market downturn can significantly jeopardize your financial well-being. Historically, you are more likely to realize additional growth in your investment portfolio by staying invested than pulling your money out. Why? Because, remember that when the markets go down, they will eventually go back up. And in the meantime, you can be buying stocks at a much lower cost. One way to offset any investing fears you may have is to look at corporate profitability and its relationship with the stock market over time. As American and overseas companies have continued to innovate and grow profits over the last eight decades, the stock market has generally followed suit by climbing higher. When companies do well, stock holders do well. Looking shorter-term, since 2013, despite acrimonious political party divisions, major environmental catastrophes, terrorists strikes etc., rising corporate earnings have been a stabilizing force for the stock market. It’s not always easy to have the intestinal fortitude to ride out the stock market’s sharp market declines. 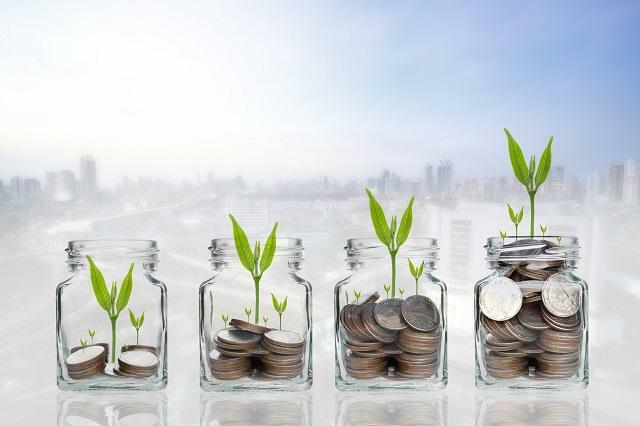 That being said, by constructing and sticking to a well-thought out investment plan and having long-term stock market compounding in your favor, you can avoid making disastrous, short-sighted investment decisions. 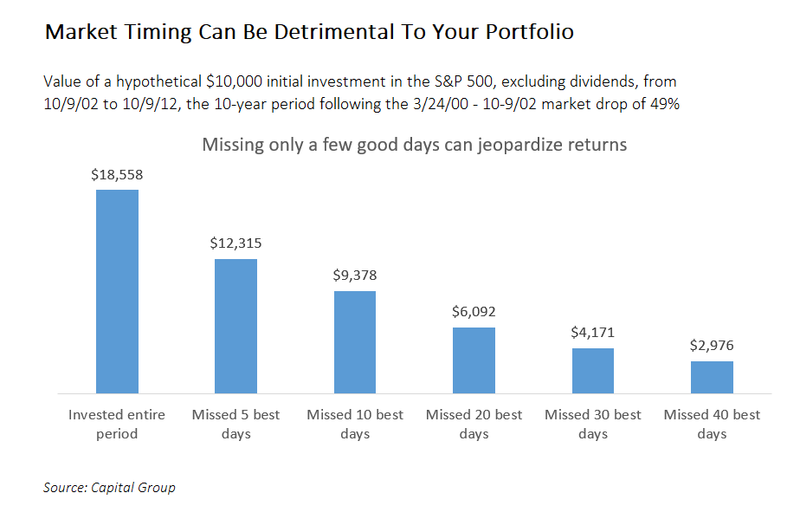 Attempting to time the market has historically shown to jeopardize returns and the most carefully made investment plans. You have to stay in the market to build wealth over time with your portfolio.